The construction industry is full of dangerous jobs. Smaller companies often have particularly unsafe workplaces – they tend to be non-union and lack the necessary training, proper equipment, and respect for workers’ reports about unsafe conditions. Workers of color disproportionately face construction dangers because they work in construction in relatively high numbers, they are concentrated in smaller, non-union firms, and they are over-represented in the contingent labor pool. Our review of 2003-2011 OSHA investigations of construction site accidents involving a fatal fall from an elevation revealed that Latinos and immigrants are disproportionately killed in fall accidents. The construction industry is full of dangerous jobs. Smaller companies often have particularly unsafe workplaces – they tend to be non-union and lack the necessary training, proper equipment, and respect for workers’ reports about unsafe conditions. 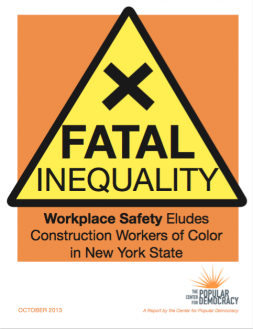 Workers of color disproportionately face construction dangers because they work in construction in relatively high numbers, they are concentrated in smaller, non-union firms, and they are over-represented in the contingent labor pool. The primary protection for construction workers’ safety, the federal Occupational Safety and Health Administration (OSHA), is ineffective. Understaffed because of inadequate funding, OSHA is unable to inspect a significant number of construction, demolition, and building rehabilitation sites active at any one time in the state. And, when OSHA does inspect a construction site, the monetary penalties imposed for violations are so small that employers can see them as just an incidental cost of doing business. Further, OSHA almost never pursues criminal penalties, even for egregious and willful violations that are directly linked to a worker’s death. New York State offers supplemental protection through the Scaffold Law (Labor Law §240), which requires owners and contractors to provide appropriate and necessary equipment, such as safe hoists, ladders, and scaffolds. The law holds owners and contractors fully liable if their failure to follow the law causes a worker to be injured or killed. The construction and insurance industries are proposing an amendment to the Scaffold Law that would shift responsibility for workplace safety from owners and contractors, who control site safety, to workers, who do not. The change will have a disparate impact on construction workers of color, which makes the preservation of the current Scaffold Law a civil rights issue. Protecting and enforcing the New York State Scaffold Law.